Join Great Taste White as it draws the winners of its Great Taste White: Choose Great, Win Great Raffle Promo on September 26. The raffle promo will have simultaneous draws at Ayala Fairview Terraces (GMA), SM City Baguio (North Luzon), Robinsons Place Lipa (South Luzon), Ayala Center Cebu (Visayas) and Abreeza Mall (Mindanao). For its fourth regional raffle draw, two winners will receive a MacBook Air, 4 winners will get a white iPhone 6, 6 winners will take home a white iPad Mini, one winner will receive P100,000 cash (tax-free)and one winner will get P200,000 cash (tax-free). Aside from the drawing of entries, mall goers can delight in games, goodie bags, Great Taste White coffee booth, photo booth, and performances by celebrity guests. On October 4, the Great Taste White: Choose Great, Win Great will culminate with its Grand Draw where eight winners will have the chance to own a white Toyota Vios 1.3 E M/T; and one lucky winner will take home P3 million cash and an exclusive Pinoy Big Brother: 737 experience. 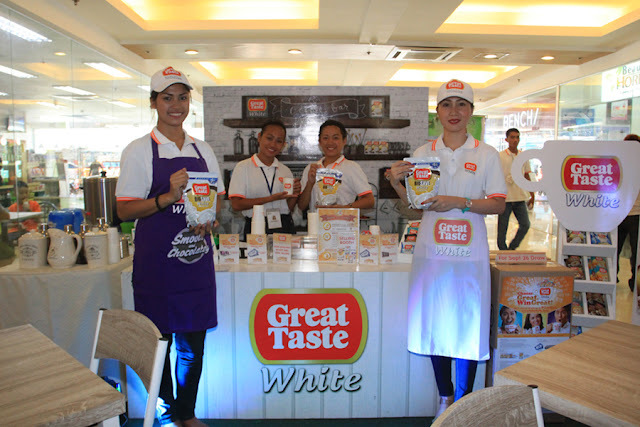 Get the latest updates about the promo by visiting the official Great Taste White Facebook page (Great Taste White 3in1), Twitter Page (@GreatTaste3in1) and website (www.choosegreatwingreat.ph). I FOUND MY TRUE MATCH!